Sushi is one of my favourites, and I could not believe my luck when I got a sushi restaurant as neighbour. 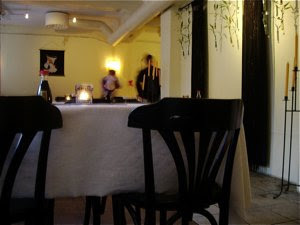 I have enjoyed great sushi there many times, and a few weeks ago, I decided to dine there. Samurai offers great Japanese treats at an agreeable price. Samurai is located at Tøyen, a mainly residential area at Oslo's East end, easily accessible by all eastbound metro lines. Leave at Tøyen / Munch museum. The restaurant is located at Kolstadgaten, behind the centre. You are met by a kind and professional staff. 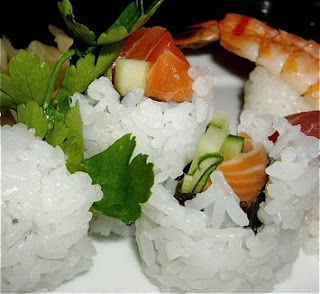 All the sushi is prepared for you from scratch, and you do not have to wait long to be served. The room used to be a dry cleaners shop, and it has a industrial character. Samurai has a very simple traditional Japanese style interior. Not very comfortable seating though, you sit on hard chairs, and the room is a little crammed - little distance to the neighbouring table. The food is delicious. We ordered menu 3 priced at NOK 141 (€15,80), more than enough to make you happy. 9 sushi og 6 maki. They were. 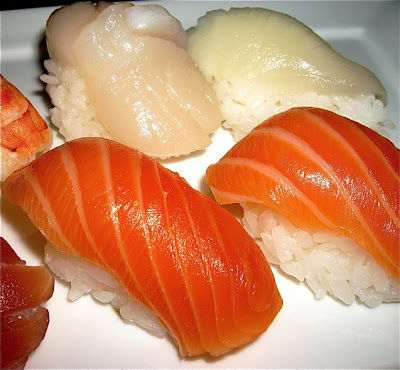 Sushi: 4 salmon, 2 tuna, 1 halibut, 1 scallop, 1 boiled shrimp. We were served an esthetically pleasing plate, with brightly colored ingredients. Both texture and taste were perfect! Deliciously sticky rice, high quality fish, prepared tender towards perfection. Great balance of mild honest taste, pickled ginger, salty soy and hot wasabi. I prefer a bottle of Kirin, the best known brand Japanese beer. Fresh and neutral, with a subtle bitter after taste. Perfect, as it does not overpower the mild taste from the sushi. Samurai Sushi is definitely a place to consider if you want to eat sushi. Restaurant a little overcrowded, but Asian guests tend to prefer the place, - a sign of quality.